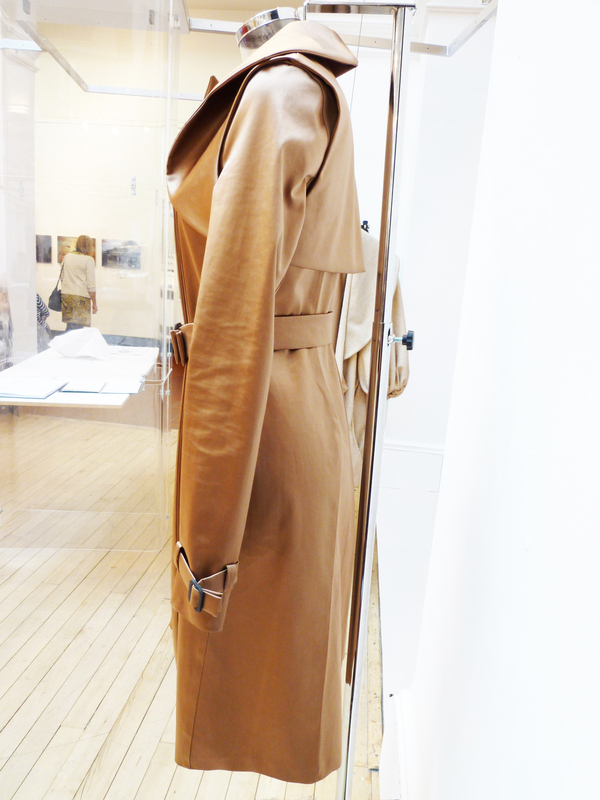 Following the success of Isabel's design for Harris tweed, she later designed a trench coat sponsored by and in collaboration with Mackintosh. Mackintosh has seen collaborations with the likes of Burberry, Comme Des Garçons, Gucci, Hermès, Louis Vuitton and Liberty. Mackintosh is renowned for its classic waterproof trench coats made by the coating of an impermeable rubberised material synonymous with the mac. This project began with a trip to the Mackintosh factory in Cumbernauld, Scotland. Having seen the processes used and learnt a great deal about the company, it was evident that heritage and craftsmanship play a key part in the Mackintosh brand. The inspiration for this project focused entirely on the ethos and aesthetics of the brand - incorporating contemporary design while adapting with the style, practicality and wearability of a traditional trench coat. This particular design is made from a unique bronze satin material that is waterproofed with the traditional rubberised coating technique. The coat was featured at the launch of the Mackintosh flagship store in Mayfair London and subsequently offered for retail on bespoke order.